The terms "will" and "trust" are often confused but they're really very different. It's also important to make a distinction between the different types of trusts that are available. The estate plan that suits you best often comes down to your personal situation and concerns. Not all trusts are created equal. Each offers different protections. Although there are almost as many kinds of trusts as there are issues you want to address in your estate plan, they all fall into three basic categories. Revocable living trusts are by far the most common. The grantor—the individual who creates the trust and funds his property into it—typically act as trustee during his lifetime. He can change the terms of the trust, undo them, and move property in and out of the trust's ownership at will. Irrevocable living trusts are different, however. These trusts are pretty much forever. When you fund an irrevocable living trust and move your property into it, you place that property into the care and control of someone else you've named as trustee. You can't take it back. You can't "undo" the trust. Irrevocable trusts have some unique tax implications and other benefits that can make them beneficial for high net worth individuals. In some cases, forming one is worth relinquishing so much control. Finally, testamentary trusts are created by a testator—the individual who writes a will—in the terms of her will. They're not "living" trusts. They don't exist until the death of the testator. The executor of her estate would create the trust as part of the probate process. A last will and testament goes into effect after the death of the testator. A living trust goes into effect as soon as it's signed. You can change your will or your revocable living trust right up until the time of your death as long as you remain mentally competent. A grantor who forms a revocable living trust typically names a successor trustee to take over management of the trust after his death. A will can only govern the disposition of property owned in your sole name at the time of your death, including interests you might have in property such as a tenancy in common. It cannot address assets that pass directly to a beneficiary by contract or by operation of law such as life insurance policies or joint tenancies with rights of survivorship. A living trust can govern and distribute any property it's been funded with. The grantor transfers his assets into it after it's formed. These can include life insurance policies as long as the trust and not the grantor owns the policy, as well as tenancy-in-common interests. Property passing under the terms of a last will and testament requires probate to legally transfer to living beneficiaries. This includes property that's directed to a testamentary trust because the probate process essentially forms this trust. Wills become a matter of public record when they're submitted to the court for probate. The terms of a living trust remain private. Property passing under the terms of both revocable and irrevocable living trusts avoids probate. The trust's terms are the mechanism by which its assets can move into a new, living individual's ownership. 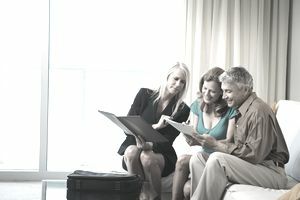 A trust can continue to hold property for the benefit of certain beneficiaries after the grantor's death, such as minor children who cannot legally take ownership of their own property until they reach the age of majority or spendthrifts who might otherwise whip through their inheritances. The successor trustee would simply keep the trust up and operating and distribute money or property to beneficiaries under the terms you set when you created the trust. A will does nothing to plan for mental disability because it doesn't go into effect until the testator dies. Her loved ones would have to approach the court to ask that a conservator or guardian be appointed to handle her affairs if she were to become mentally incapacitated before that time. This can be both costly and stressful. Provisions for disability can be written into a revocable living trust. The successor trustee the grantor has named to take over at his death—someone of his choosing, not the court's—will also take over if he becomes incapacitated and unable to manage his own affairs. NOTE: Laws can change frequently and this information may not reflect the most recent changes. Laws and rules can vary somewhat from state to state. Please consult with an attorney for the most up-to-date advice. The information contained in this article is not legal advice and it is not a substitute for legal advice. Do You Know the Difference Between the Types of Trusts?